Hello, thanks for visting my page. I am a 26 years old cemist and am currently taking Doctorates Degree at the University Tübingen. When I was a little boy, my brother and I used to make bows out of hazelnut branches. Making a simple bow is easy, but it was very difficult for us to make good arrows, and these arrow did often tend to break after a few shots. I got the idea of making myself a slingshot to solve that problem, and shoot little stones instead. My parents gave me a big rubber ring, I found a little wooden fork and was hooked to slingshots. I was surprised to see how well my little flip performed, and I spent much time sitting in a graveled footpath, shooting gravel all over the area. The slingshot had a higher range than our bows (I guess because my bows were not overly well designed, or I was simply too weak to use them properly), the slingshot was easier to carry around and ammo was everywhere. 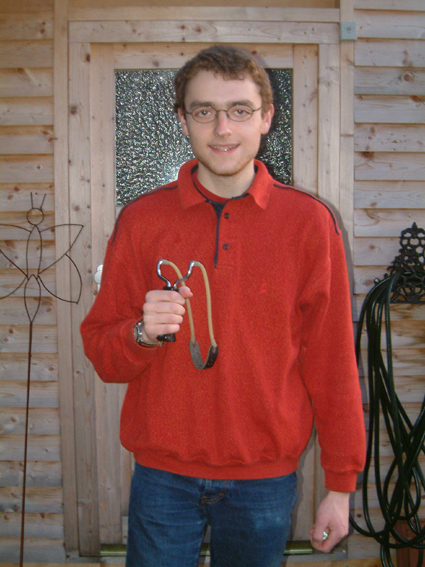 I made several slingshots and I remember how my father showed me how to use wire to attachthe rubber. I have no idea what happened to these slingshots, but I still have some of the original rubbers. The rubber bands were rings to seal marmelade glasses, they could be purchased everywhere. My slingshots had no pouch, the flat rubber was broad enough to propel peas and small gravel. I was hooked. I got older, my arms became longer, I grew stronger and at some point, the little rubber rings were not enough anymore. I asked my parents for a commercial slingshot (I knew they existed), and they gave me one for birthday when I was 13. It was a Barnett Strikenine, the first version, with simple flat handle and a click-on rubber attachment that Barnett abadoned with reason. Thats when I started shooting slingshot as a sport. Shooting a slingshot isn' easy, especially when your arms are still as short as a 13 years old boys arms are, and the rubber bands are - like with almost every commercial slingshot - too long, even for big adults. My ammo were stones, peas, sometimes a marble or a bullet that I rolled out of clay-rich earth that happened to exist nearby. I kept on shooting, and every time I hit a fork end with a stone and nicked the bands, I shortened them and they automatically got the correct size. Over the years, never quit this hobby, and slowly gained more and more experience. I can proudly say that I never harmed any animal or human and destroyed no property. I wanted to know more about slingshots. And the Internet was a great help! I searched for slingshots and found some pages and pictures from retailers. 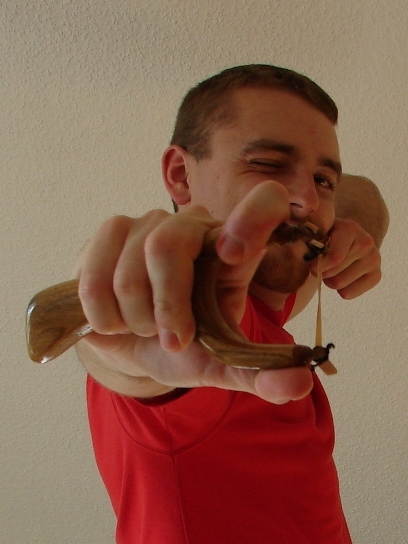 Then, I met some other slingshot enthusiasts and finally decided to make this webpage to create a source of informations for fellow shooters. The page was not more than a list of commercially-made slingshots. But it slowly grew and at some point, more and more people visited it. I was overhelmed by the friendliness of most slingshot shooters. Most of my slingshot collection came in as a present from manufacturers and slingshot enthusiasts, as well as lots of pictures and, most important, knowledge about slingshots. The art and sport of slingshooting was quite popular in the 50ies to 70ies, then declined to obcurity. The last 10 years brought a big revival of it. The internet allows slingshooters to connect and share their experiences and stories, and the number of meetings and tournaments worldwide is growing constantly. These are exciting times for slingshooters. Thats it how it started. If you want to participate in this little slingshot story, simply register in the forum and join us!